Pope Innocent has called for a Fourth Crusade against the Saracen, and knights from across Europe gather to respond. Cainites and mortals alike taint the enterprise with their own ambitions. In Venice, Cainites gather to decide on the crusade's course, only to watch it spiral out of control and head toward Constantinople and its powerful masters. Blood calls to blood, and the flmes of mortal hatred burn brightly. 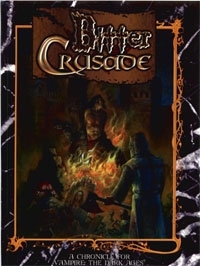 Bitter Crusade is a chronicle detailing the Fourth Crusade, the latest Christian adventure toward the Holy Land. Over the course of three stories, set in Venice, Zara (on the Dalmation coast) and Constantinople itself, it shows how mortal and immortal agendas conspire to turn a holy war into a mockery and set Christian against Christian. In the fires that end it all, the Long Night itself comes to an end. The chance to put your players' coterie center stage for the transformation of the Dark Ages setting.